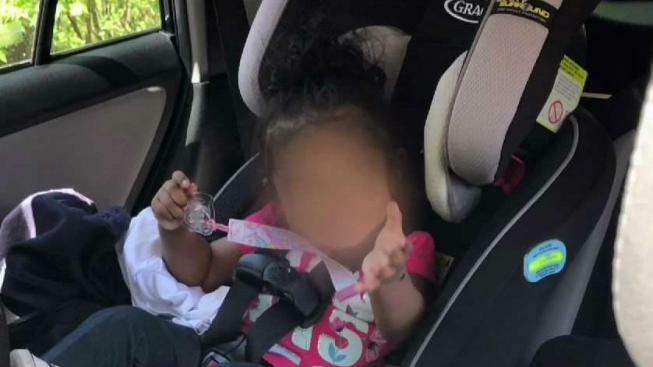 "He was in hero mode, taking care of this baby"
An officer rescued a baby girl who was left in a hot car for hours Tuesday in Suitland, Maryland -- hours after that same officer discovered a man lying face-down in a grassy area nearby. Authorities later learned that man was a family member who was supposed to be taking care of the one-and-a-half-year-old girl, they said. The man's name has not been released, but Prince George's County Police say he was charged with reckless endangerment and a related unattended child charge. He was suspected to have been under the influence of a drug. Cpl. Darryl Wormuth found the man in the 3600 block of Parkway Terrace Drive, conscious but verbally unresponsive, according to a release from police. Wormuth called for medical help and then hit the panic button on the man's car key fob to try to find his car and any identification that might be inside. Although the fob didn't activate any cars in nearby parking lots, "something just kept nagging at my mind," Wormuth said, according to the release. "Something had told me, basically, go back to this area," Wormuth said at a news conference. He went back to the apartment complex on Parkway Terrace Drive after escorting the man to the hospital. That's when he discovered a car with a window down and its engine running, with the little girl inside. "God, please let this child be alive," the officer thought, according to police. The girl's head was tilted forward and she wasn't moving. But he soon learned she was breathing. Responding officers and the apartment complex manager gave the child food and water. "He was in hero mode, taking care of this baby," property manager Latrice Leake said about Wormuth. "A lot of times, the good Lord gives us that situation or that scenario, and it's our job to identify it and act on it," the officer said. An image shared by police shows a car dashboard displaying an external temperature of 81 degrees. The child was so thirsty that when she was given water, she drank so fast she almost choked. Wormuth found a phone in the car and was able to contact the girl's grandmother. She and the girl's mother took her home.